Invisalign is a clear alternative to braces. We use 3-D computer modelling to make a series of virtually invisible removable “aligners”, which gently and relatively painlessly starts to straighten your teeth. 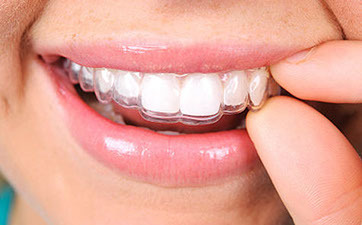 Invisalign treatment consists of a series of aligners that you switch out about every two weeks. Each aligner is individually manufactured with exact calculations to gradually shift your teeth into place. One of the benefits of clear aligners is that they are discreet and practically invisible when you are wearing them. They are made of a durable, body-safe plastic that lets the natural colour of your teeth show through. You can have treatment to straighten your teeth with minimal disruption to your lifestyle. Since Invisalign is removable, you can also eat, drink, brush and floss with ease. Invisible braces can give you quick results in months. Since Invisalign is replaced every two weeks, it allows you to track your progress and see the difference that it makes. You can enjoy the benefits of a more beautiful smile without going through the discomfort of wearing metal braces. Whether teeth are crowded, too far apart or have shifted since wearing braces, we will help you gain a straight smile.